The only engine as free-revving and responsive as this that we’ve ever experienced has been the Porsche Carrera GT’s 612-hp 5.7-liter V10. The resemblance is uncanny, from the heavy, lash-free action of the throttle pedal to the rabid way the engine accumulates revs. The LFA’s ride is busy but not jarring, and the refinement is pretty good given that the subframes that locate the suspension are hung from a stiff carbon-fiber tub that is bound to transmit vibration…overall the 2011 Lexus LFA feels about as relaxed on the pavement as a Ferrari 599 GTB, which makes it entirely happy as we trundle away. Flawlessly made carbon-fiber trim pushes up against exotic metals, while the hand-stitched leather is supple and expensive. As a place to enjoy, be comfortable and operate a machine, this might be our favorite supercar cabin of them all. Never thought we’d hear ourselves say that. 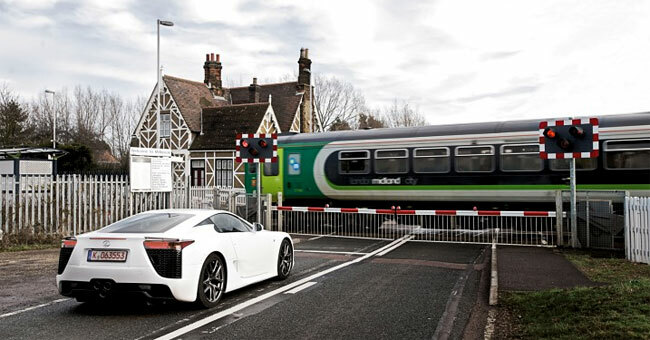 This is the very first review of the LFA that takes place entirely on public roads rather than a race track, and as a result, there’s a much clearer sense that the Lexus supercar is equal parts performance & luxury. For only having four hours of seat-time, Chris Harris turns in a review filled with plenty of insight. Recommended reading.